Card Text Play: Put up to 3 damaged enemy creatures into your archives. If any of these creatures leave your archives, they are put into their owner’s hand instead. What happens if after archiving enemy creatures via Mass Abduction, my opponent plays Dysania (“Play: Your opponent discards each of their archived cards. You gain 1 for each card discarded this way.”)? 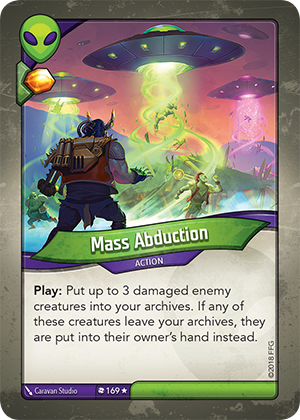 All cards archived via Mass Abduction return to their owner’s hand. Since they were returned to hand and not discarded, your opponent does not get Æmber for those cards. Can I put fewer than 3 enemy creatures into my archives? Yes. “Up to 3” means you can choose between 0, 1, 2 or 3 enemy creatures to put into your archives.